Jumpers can come in all forms some that are in a suspended contraption and some that go over doors. The use of jumpers can be a point of contention among some people. Trust me, being a first time mom and having a husband that works many hours I get it. I totally understand that sometimes you need a minute and need to put baby somewhere where they can be entertained. A jumper seems like an easy solution to this problem. It looks fun right? As a new mom I decided to look a little closer at this. This post may contain affiliate links. I only recommend products I use or personally love. An answer in short – moderation is key. I’m always careful not to keep baby my in equipment all day long. I make sure to provide appropriate time out of any device (not just jumpers) to explore and play. 1. Look at how he is up on his toes. It makes me think he is searching for a point of stability as he isn’t ready to be in this position on his own. Being on his toes for stability is adding to further poor positioning. I also noticed that on almost every jumper box in the store practically every baby on the box is on their toes. 2. His body is thrust forward in the jumper. In this position it makes it difficult for him to use his gluteals or hip muscles. I’m thinking he’s most likely hanging out on ligaments in this position. It may also result in his head being back too far and shoulder blades pulled back too far. Being pitched too far forward also gives them a poor sense of body awareness and sense of where they are in space. Think of how they are supposed to learn to balance standing on their feet if they are in a pitched forward position all the time? 3. He can’t see his feet! It makes me think about learning to stand and balance. Seeing their feet is important to help them develop a sense of balance control. 4. Take a look at his back and how it is in the swayback position. This further decreasing the babies engagement of abdominal or gluteal muscles. I try to keep contained play in one device to no more than 10-15 minutes a day. This isn’t just meaning jumpers, but all equipment that “contains” a baby. Yes, I own a jumper and yes I have used it. I like the rule of 2 and 15 (baby equipment no more than 2 times per day for 15 minutes at a time) and try to follow it as best I can ( I’m not perfect!). Floor play is the absolute ideal. I have recently purchased a play yard that I LOVE. My son is belly crawling all over the place and in the play yard he still has the freedom to do this. He is still allowed independent floor play and allowed to explore his environment. I can be within eyesight and feel comfortable with floor time. So in the end, I’m cognizant to not overuse any type of equipment including jumpers. Do you have a recommendation for improving core strength for babies? My little one is on the later end for gross motor skills, and her doctor recommended we use the jumper for strengthening her core. She’s 11 months. Floor play/ tummy time is always the best for promoting motor development. 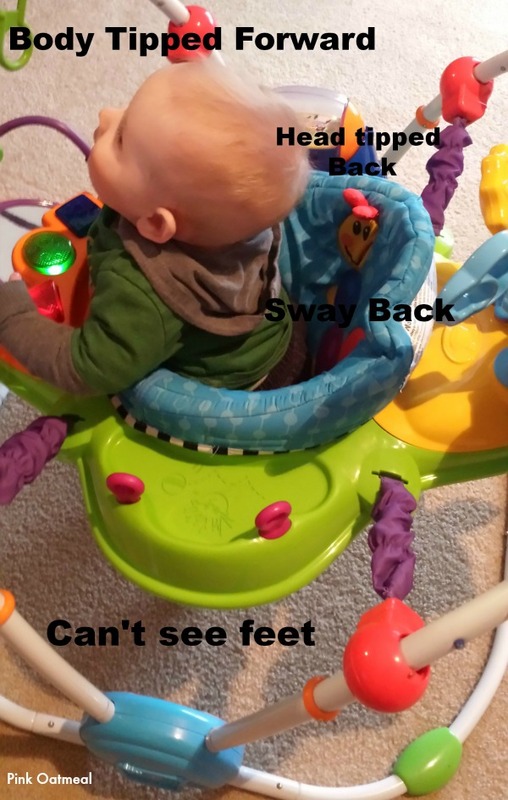 Toys that contain children often lead to bad positioning and cause poor use of muscles in babies. Without physically seeing your daughter it is hard to give any specific exercises. It would likely be beneficial to you to find a pediatric physical therapist in your area to help come up with a program to promote strengthening. Thank you for this! My husband and I were contemplating buying a jumper/exersaucer for our son, but decided to ask his pediatrician before shelling out the money. He told us exactly what you said here. We decided to put the money toward hiring a photographer to come to our home for family pictures instead. Much better use of the money, and I feel good knowing it was the best choice for my son too. I should also add that his daycare had a few of these as well. I asked that my son not be put in them more than 15 minutes once or twice a day. I’m sure they don’t mean to leave babies in them very long, but when caring for so many, it wouldn’t surprise me if time slipped away, and the babies spent quite a bit longer in there. I think it’s fabulous your ped gave you great advice and that you are advocating for your son at daycare! Check in with them every so often on it, I bet if they know you are concerned it will make them think when putting your child in it! I actually talked about a photographer for baby pics being a great idea in my top gifts for baby! Thanks for reading! I have to agree. I’ve had door-bouncers, but they’ve only used them very rarely. I think aside from all the physical issues it’s very easy to see these contraptions as a babysitter and leave children in them for long periods without interaction and comfort. I’ve never had a ‘jumper’ like these and I never would. Exactly even if you mean well it’s easy to see how the time passes so it’s best to avoid them when you know they aren’t good for your baby! Oh, how I wish I would have known this information 10 years ago when my twins were babies. They spent a good bit of time in bouncers like that and now I have one who is STILL a toe-walker. It seems like every day information spreads so much faster with social media! Ten years ago it wasn’t so easy to find this info! Thanks for reading! What about babies and toddlers who are unwilling or unable bear weight through their lower extremities? Wouldn’t a bouncer or exersaucer encourage that weightbearing if the child is seated in it correctly? (feet flat, able to control head and trunk, etc.) What about children who seek vestibular and proprioceptive input? Great Questions! 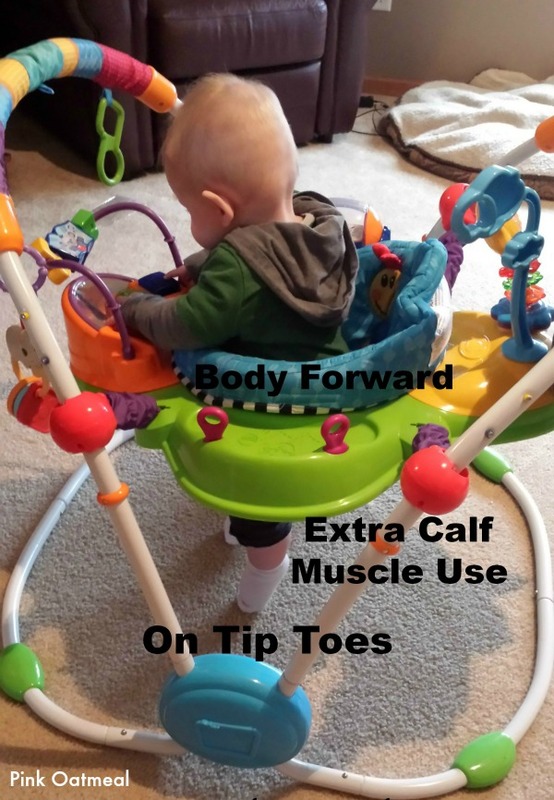 The problem with devices like exersaucers and jumpers is that they are very difficult to get a baby in them in a position that allows for good posturing. To assure good posturing likely an adult needs to be there at all times and likely will need support under their feet etc. This skill of standing usually takes place between 6-10 months. If a child is having lots of trouble bearing weight and should be it is always best to find a physical therapist or doctor who can help devise a therapeutic plan as appropriate for the individual child. Time on the floor is great for seeking vestibular and proprioceptive input. Rolling is a great vestibular input. Proprioceptive input is huge on the floor as there is much more appropriate contact on the floor. Proprioceptors help us to know where we are in space. So if you slip are proprioceptors kick in and help us to re-adjust. In a jumper if the baby is falling forward their proprioceptors don’t have to kick in since they are in the device. They don’t get to experience understanding where they are in space when in these devices. I understand what you mean about busybodies I have one too! Our play yard works really well for a busy body he can move and play and play and I know he is safe if I have to take my eyes off of him. I think the fact that you are setting a timer is excellent. As long as you try to keep it under 15 minutes a day total in devices like jumpers, exersaucers etc. and give him plenty of time to be on the floor playing. I understand a mom needs a minute! 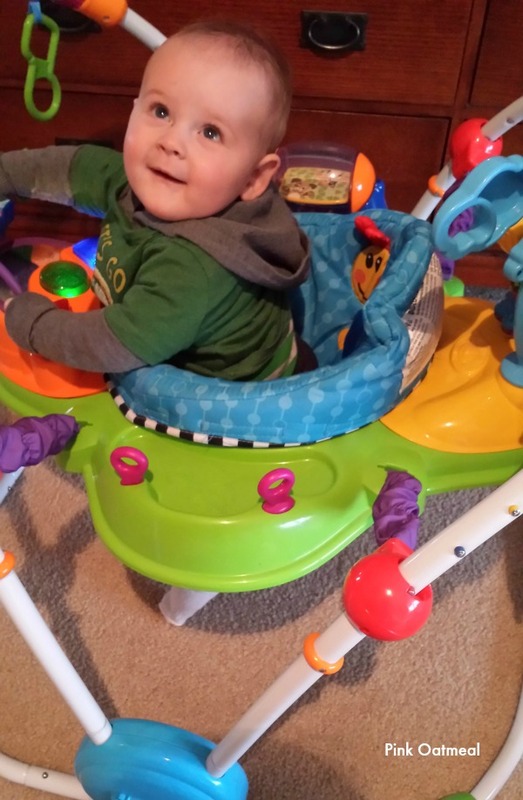 So would you recommend an exersaucer or just nothing at all? My son has torticollis so I am looking for something that’ll help keep him off his back and the flat spot of his head. We do tummy time but it doesn’t last long. The exersaucer is another piece of equipment that is best for only a short burst of time NO longer than 15 minutes total per day. It also results often in poor posturing, sense of self in space, and the inability to explore the environment. I have a post about tummy time ideas https://www.pinkoatmeal.com/2014/01/tummy-time.html. I also did a lot of tummy time on an exercise ball with my little guy when I felt he was old enough. 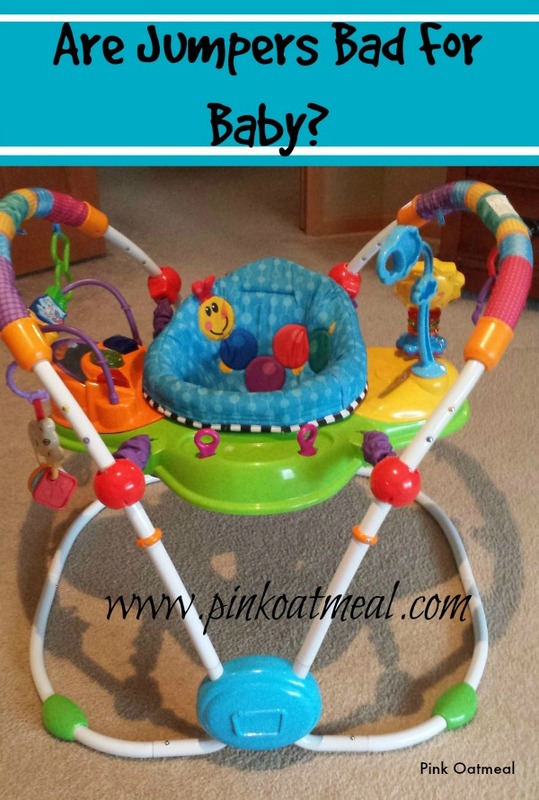 Here is a post on that https://www.pinkoatmeal.com/2014/03/baby-play-ideas-ball-play.html. Hope they are helpful! I am a pediatric occupational therapist and I recognize much of what you are saying and only allow my baby (4 months old) limited time in the jumper a day. I actually have that exact jumper in the picture but noticed the setting was on the third highest setting. Shouldn’t you lower the setting so the kiddo would have more of his feet on the floor like the directions say just to make sure the child’s feet are not flat on the ground. I would be worried too if my kiddo looks like yours, but we have the correct setting for her height. Thanks for reading, the setting was just one up from the bottom setting. That being said he never really used the jumper at all, it was something a friend had given and mostly sat in our basement. For many children who use jumpers, poor posturing is still a concern even if their feet are flat on the ground as they still have a tendency to shift their weight forward resulting in the sway back and tipped forward head etc. This happens because babies have the tendency to lock out their knees as a form of stability when their strength isn’t adequate and therefore shift their weight forward onto their toes. This is especially a concern when the baby is younger and has not yet assumed good core strength. Also no matter what setting jumpers give babies that poor sense of where they are in space. They are also just another form of a container device. Like you, I recommend limiting time in the jumper! You make a very good point that people should pay attention to settings on their devices if they plan to use them. hi! my 9 month old does not really bear weight on her feet well/stand supported (like when holding her under her arms with feet near a flat surface). she is crawling and sitting up great, but has never put all her weight on her feet except momentarily. she also frequently curls her toes under – she clinches those toes shut. we have a jumper, but at most she is in 10 min a day. i often reposition her toes so they are not curled under. anyway, at her 9 month appt the pediatrician was concerned that she was not bearing weight well on her feet. my lo does not have hip dysplasia, just low muscle tone in her legs the md said. she recommended that i quadruple the time in jumper/exersaucer. i’ve done that now for like two days, but my observation is that my lo just sits in the jumper most of the time. she does indeed bounce. but mostly she just sits, not bearing weight on her legs. i feel like she is getting less exercise overall in it! not sure what to do…do you have any thoughts? If it were me I would see if I could get a referral to PT or OT in your area. In some states or depending on insurance you don’t even need a referral for PT – but that is something you would need to look into in your individual case. A PT or OT can perform an assessment and give you appropriate ideas to help with weight bearing depending on what they find in the assessment. I hope that helps! Good luck! I am also a PT (early intervention, birth-3) and I completely agree and support your post. I also used to consult for The First Years so I have insight to the product development/design part of it as well. Manufacturers may have age recommendations and instructions for ideal use. But the reality is that babies are put into these contraptions much younger/less-abled than recommended, at an age when they are entertained by it and thus it is useful, in moderation, for parents to be hands-free for a few minutes. Great info and I love how you relate it to “real life moms too”. I am an OT myself and often feel the tug between my recommendations as an OT and real life recommendations as a mom so this was a nice article that blended the two nicely together.